Happy Monday everyone, I hope you had a great weekend! Mine was a bit of a mixed bag as I had an amazing time doing my In the Dressing Room review of Anthropologie (if you missed it, don’t worry, you can check it out on my Highlights on Instagram) but I was feeling really run down and mentally exhausted yesterday so I got some much needed rest. And now the countdown to March 31st is officially on! Today is a very special day because it is the start of this year’s annual swim week here on the blog. I have 7 days of new swim suits to share with you and I can’t wait! I am doing things a little differently as I am only featuring 3 brands but I will share a few of my favourite suits from each one. And not to worry I will feature some of my other favourite swim brands once they launch their new collections so stay tuned. I cannot believe how much my feelings about swim suits have changed over almost the last 4 years since I started the blog. If you have been around that long (thank you!) then you know that a swim look book was one of the very first things I did as a blogger. I remember a lot of people asking me why I chose to do that, especially for my first photo shoot with a real photographer. First off, I started the blog in July so at the time swim suits made sense. And second, I really wanted to rip the band aid off. I have always loved swimming and going on tropical vacations no matter where I was on my self love journey so I did always have several suits on hand and I tried to be cute. Granted there was no bikinis but there sure were a lot of tankinis lol. I can’t say I am a huge fan of them now. I probably made the biggest break through last year when I shot my first Curvy Beach string bikini and since then there has been no going back and I don’t have a single regret about it. The latest hurdle that I have overcome is not feeling like I need to wear a suit that has underwire in it. I always felt that I should wear underwire because I have a large chest but sometimes you just want to be comfortable and free and honestly if you find a suit that is constructed properly then I can assure you that you won’t miss it. It has opened up a whole new world of other options to me that I am really excited about. This week’s posts are going to be short on the writing front in comparison to what you normally see from me because well I don’t have much left to say about my relationship to swim except that I love it. And of course I always encourage you to step outside of your comfort zone and try something unexpected. And if you are one of my peeps who haven’t put on a swim suit for years I encourage you to go for it! Don’t let fear hold you back from enjoying life. On the flip side I didn’t skimp on the photos so enjoy! ELOQUII is the first brand I am going to feature this week. 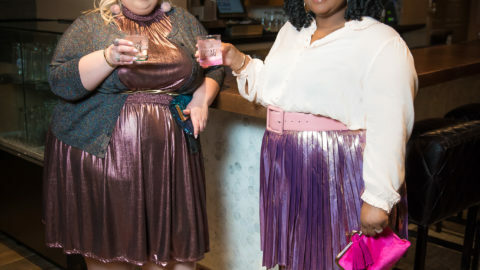 ELOQUII maybe hasn’t been in the swim game long but let me tell you they have certainly made quite an entrance into the space. I anxiously look forward to their collection each year now and this year they certainly did not disappoint. They have already released four mini collections and just when I think I can’t like another suit as much as the ones I got, bamn they throw me a curve ball and I want another one! I definitely had to show some self restraint. What I love about their suits is they are not afraid to offer unique pieces whether it be the silhouette, the print, or the colour combinations. They aren’t afraid to make a statement. And of course they offer everything in size 14 to 28 which I really appreciate. The suits are also very good quality, they have nice thick fabrics, full linings, and thoughtful details like metal hardware, adjustable straps and closures and coordinating cover ups. And despite the quality the price point is very comparable to most major brands. This first look I pretty much sum up as the perfect “Lisa” look. It has bright colours, pattern, florals, fun details and a great style. This kimono cover up went it my cart immediately and I knew that it was likely that my size would sell out quickly. And unfortunately I was right as the size 26/28 is currently sold out. I was nervous as to whether it was going to fit me or not though. I really wanted it to have that oversize flowy kaftan feel to it and sometimes pieces like this from ELOQUII can be a little snug on me. So you can imagine by pure delight when I tried this on and it fit just how I had imagined. Its so light and breezy and comfortable, I will totally be wearing this as a dress this summer too. And this versatility makes it a great piece to bring on vacation with you. This bikini with it bold stripes and pink belt and bow details was the perfect compliment to the bold floral of the kimono. I am wearing the 28 in the bottoms which are your basic high waisted ones which are my personal favourite. These totally fit as I would expect them too. For the top I learned from my previous ELOQUII swim purchases and I sized down to the 26. I highly recommend if you are ordering a bikini top to go based on your band measurement. It does have an adjustable closure to help you get a good fit. I was also really pleased that this fit my size H cups perfectly. If you are smaller in the bust you may also want to consider sizing down. You can wear this top with or without straps depending on your preference. This second look is a little unexpected for me because I tend to gravitate to bright colours and prints and this rich burgundy colour is much more subdued. I do love the contrast of the darker colour against my skin tone. This suit is interesting because it is technically a one piece that comes in two pieces if that makes sense lol? The bottom and the top are actually connected by the strap that criss crosses against your stomach, slips into built in hooks on the bottoms and ties in the back. It is a really interesting style, something I haven’t seen before. I think it was really smart design to make it two pieces physically. I have seen other suits with cut outs like this and they can be extremely difficult to get on when they are sewn together. I have had this suit for a couple of months now and it is so comfortable to wear. It has to be the best fitting ELOQUII swimsuit I have gotten so far. I am wearing the size 28. I paired this suit with a trial print wrap I already had but I did give you the link to a super cute animal print cover up that ELOQUII has to go with it. Well that brings installment one of this year’s swim week to a close. Special thank you to ELOQUII for gifting me these suits. All opinions are my own, as always. This post also contains affiliate links which I may earn a small commission from. These allow me to continue to provide you with amazing content. Stay tuned for the next installment on Wednesday and leave me a comment as to which suit is your fave and why below. Lisa, you look so beautiful in both suits. I like bright colors, and that 3rd pic down, full length shot rainbow bikini, just has me bedazzled! I am going through some tough times, and knowing that you will be posting more swimwear this week has at least brought a smile to my face. I wish I could take you home with me! I’m just happy that you can instill confidence in women and show them it’s OK to dress to show off your figure, and that you don’t have to hide under a cover-up on the beach just because you are full figured! I have always been attracted to full figured women, but I don’t think I have ever seen a women of any size as attractive as you! I love the colorful way you dress in dresses and feminine clothes, I prefer feminine women who dress that way. I have been following this blog for some time, but never had the courage to post before. I will try to more often from now on. But today’s post was so gorgeous I just had to let you know. Looking forward to the next set of swim photos, and have always enjoyed seeing you dressed up so glamorously. Soft Hugs Lisa, you just made my day.